China and India may be Asia’s largest economies, but they aren’t the only countries with growth potential on the continent. Southeast Asian countries can also offer compelling investment opportunities. Thailand, known as the “land of smiles” because of the expression its natural beauty and friendly people inspire, is a country where we believe the economic prospects could give investors reasons to smile too. Unlike other Southeast Asian nations, Thailand (known as Siam until 1939) managed to escape European colonial rule. That doesn’t mean Thailand has escaped Western influence, or internal conflict. Coups, protests and periods of military rule have triggered social and economic turbulence throughout its history, and political leaders today have struggled to reconcile with opposing forces and reform the constitution (drafted in 2007 under military rule). An example of this fighting spirit was on full display when Thailand’s GDP growth sank in 2011 to a mere 0.1% in the wake of flooding there, but then quickly rebounded. While forecasts differ slightly, recently, Thailand’s central bank raised its expectations for 2012 GDP growth to 5.9%, with growth forecast at 4.9% for 2013. Policymakers said stronger-than-expected expansion of private investment helped drive improved growth prospects. Domestic economic strength helped Thailand’s equity market post one of the best performances in Asia (and even the world) in 2012, with the benchmark Stock Exchange of Thailand (SET) Index returning more than 35%.1 Industry data showed loan growth supported banking stocks in particular. Interestingly, over the past two years, some European banks—dealing with a debt crisis at home—withdrew from some emerging markets; this seems to have benefited local lenders in Thailand. The Thai construction industry was another well-performing sector story, as suggestions that a ramp up in Thai infrastructure projects could further increase demand for building materials. 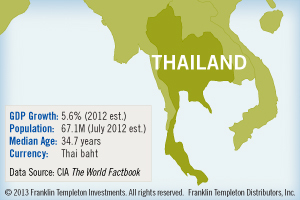 During Thailand’s more challenging times over the past decade, some questioned our investments there. Our essential investment philosophy is to look for long-term value on a stock-by-stock basis rather than with reference to index weightings or top-down macroeconomic calculations. We hand-select companies which we believe can survive downturns and have the potential to emerge even stronger, in Thailand or anywhere else on our emerging markets map. However, a number of our investments also reflect macroeconomic themes that we believe to be significant. For instance, we believe emerging market growth is likely to drive a secular bull market in commodities and, by our calculations, rising consumer wealth and the emergence of a large middle class should drive growing consumer demand. In our opinion, the economic backdrop for many emerging markets such as Thailand is currently stronger than that of most developed markets. Thailand’s natural resources, dynamic industrial scene, productive agriculture sector and robust tourism industry look like logical drivers for continued growth potential. Thai exports, including machinery and electronic components, agricultural commodities, and jewelry, dominate the country’s economic pie charts, accounting for more than half of GDP.2 Thailand is the world’s largest exporter of rice and rubber, and the country produces more than a third of the world’s computer hard disk drives. Although it still imports a significant amount of its energy needs, Thailand’s offshore natural gas reserves are also notable. The Thai government has provided various stimulus efforts, including increases in the minimum wage, which should help boost consumer income levels and could fuel greater domestic-led growth. Tax reductions for companies should also spur business activities as well as domestic growth. Attracting investors to its markets is also important. The Stock Exchange of Thailand (SET) is developing rapidly and aiming to become a regional capital markets hub. Investors’ appetites were whetted by a rise in high-value initial public offerings last year, new regional electronic trading links, a boom in Thai-companies’ cross-border M&A activity and a loosening of regulations that govern stock listings. Thailand has certainly suffered from political upheavals, with much of the turbulence stemming from power struggles between the country’s minority elite establishment and the rural poor, which represent the majority of its population. This certainly represents an ongoing risk to investing there. As investors, we don’t tend to take sides in such battles, but we do try to change the financial framework if we feel things are moving in an unsustainable direction. As a major trade partner to rapidly-expanding Asian economies, we believe Thailand has potential to benefit from the continued developments in emerging markets. Current equity valuations in Thailand generally remain attractive to us (as of early February 2013), though not without potential growth obstacles that do bear ongoing scrutiny. But all in all, we believe investors in Thailand do have plenty to smile about. 1.Source: Bloomberg LLP. The SET Index is a capitalization-weighted index of stocks traded on the Stock Exchange of Thailand. Past performance is not indicative of future results. An index is unmanaged and one cannot directly invest in an index. 2. Source: CIA, The World Factbook, 2013.